You know that your RV roof isn’t under warranty when you drive it off the lot. And you know you’re in trouble when water is leaking inside your camper - no matter how old your RV is. Whether you just drove off the dealership’s lot or you’ve owned your camper for many years, you know that your roof isn’t under warranty. Thus, you may want to get your trailer’s roof replaced for the 20-year warranty and peace of mind. You don’t want to mess around with a lot of sales guys, either. Instead, you want a professional RV roof repair and replacement company that has a solid record of replacing roofs. 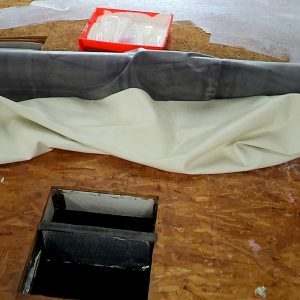 Never Leak RV Roofing has served the entire state of Florida for the past 30 years and has been working solely on roof repair and replacement. And we’re certified through the Recreational Vehicle Industry Association (RVIA) to repair and replace RV roofs. When you contact Never Leak RV Roofing, you’ll get a free inspection of your roof in our Jensen Beach RV Service Center location. If our location is out of your way, we’ll come to you anywhere in Florida to inspect your RV or camper roof for a fee. If one of our technicians finds soft spots or other evidence of water leaking through your trailer, we’ll schedule with you to repair or replace your roof. You won’t need to stay at a hotel either. Our service center has RV hookups available, so you can stay in your camper throughout the roof replacement process. We'll go through the following 10 steps to remove, clean up, and replace your trailer roof. 1. First you'll need to make an appointment for your trailer's roof replacement at our Jensen Beach location. We will inspect your roof for leaks and begin the roof replacement process as necessary. 2. Then, we’ll take off your roof whether that’s PVC, TPO, fiberglass or EFDM. We’ll also remove all vents, caps and seals. 3. We’ll then remove all rotted plywood. 4. 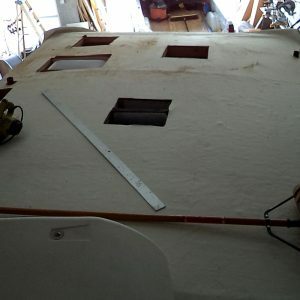 After removing the plywood we’ll remove all insulation that is wet or has mold or mildew on it. 5. 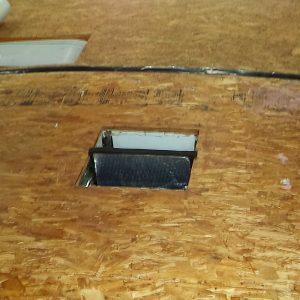 We’ll then add new insulation to the top of your RV to hold in the air temperature. 6. We’ll put on new plywood. At this point, we’ll either add our rubber roof replacement, or we’ll rewrap your roof if you choose. 7. We’ll apply our rubber coating sealant on your roof. 8. 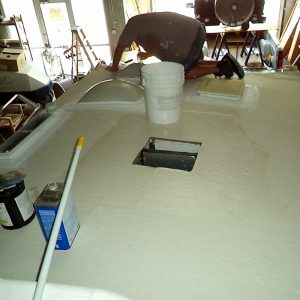 Next, we’ll apply the first coat of our rubber roof that covers all seams. The first coat takes about three hours to dry. 9. We’ll apply a second coat of our rubber roofing. The second coat takes 24 hours to dry. 10. Finally, we’ll put back your roof as well as all vents, air conditioner and sewer caps and seals. In the end, you’ll have a great sealant on your roof as well as a 20-year roof warranty. This means when we’re finished with your RV roof replacement, you’ll continue traveling without worrying about your camper’s roof leaking when you encounter your next rainstorm. Ultimately, if you want your RV roof to be inspected and replaced by Never Leak’s expert roofers, contact us today at 1-888-306-8886 or fill out our contact form.